A mix of contemporary and transitional detailing, this sofa has a look that transcends time and functions beautifully in any living room. 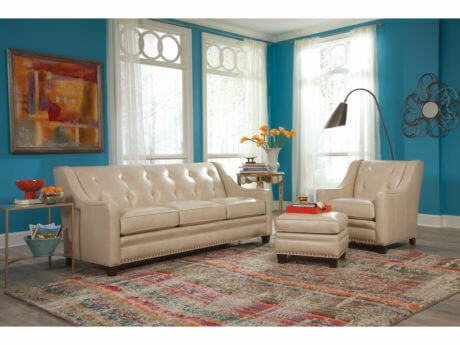 Tufted back, track arms and nail head trim all blend perfectly to make this chic sofa unique. 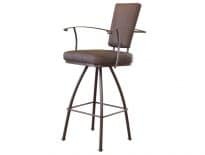 Available in many different colors of both fabric and leather, you are sure to find a style that fits your decor exactly with more custom tailoring options than even we can count. Seat support: Under each single-seat cushion is a pre-engineered, heavy-gauge coil-spring unit with an elevated front support edge that ensures individual comfort for each person. All spring connections are insulated to ensure silence. Padding & Ergonomics: A 2.5 lb density polyurethane foam, considered the highest quality foam available in the upholstered furniture industry. Qualux Ultra is standard in every seat cushion enabling us to offer a lifetime guarantee against loss of resiliency. Warranty: Smith Brothers proudly offers a lifetime warranty on the hardwood frames, spring units, and Qualux Ultra seating cushions and a two-year warranty on tilt-back and swivel mechanisms. Note: Due to the custom hand-crafted nature of tufting, unique variations in appearance and seating comfort should be expected. Additionally, the tufting and seams make it impossible for horizontal and vertical patterns to be fully matched. Consequently, NO patterns will be matched on the 203 style.